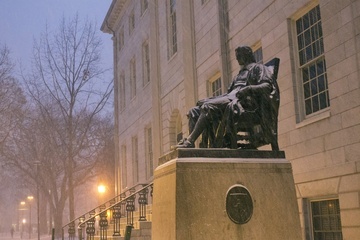 Like a beacon of light shining from the center of Harvard Yard, John Harvard’s left foot entices all sorts of people, from international tourists in search of good luck to reveling students in search of a place to relieve themselves. Because of the latter, one is inclined to pity the former. But does anyone truly know exactly what those tourists’ poor, unsuspecting hands are touching? Is it Harvardian urine or just plain metal? Armed with state-of-the-art swabbing technology and chemistry tutor Stephen J. Haggarty, FM put on its mad-scientist hat and sought the answer to this pressing question. The experiment was carried out using two types of chemical tests—Luria broth plus ampicillin (an antibiotic), and YEPD (yeast extract with peptone and dextrose)—and four petri dishes: one sample for each foot (for comparative purposes) and two control dishes. After one week’s incubation, the two sample dishes blossomed with colorful fungi—savory reds and yellows of yeasts, lovely whitish blobs of a penicillin species, green spots of trichoderma and delightful traces of aspergillus—but nothing out-of-the-ordinary for an outdoor statue. “These are the kinds of species you might find on the metal railings outside University Hall,” says Gray Professor of Systematic Botany Donald H. Pfister, who identified John Harvard’s fungi. Although accustomed to the outdoors, the statue finds protection from the natural elements in an outer coating of paraffin wax. According to Manager of Administrative Operations Zachary M. Gingo ’98, the wax makes the statue easy to clean. “In most instances we can wipe off the substance (shaving cream, soap, food debris, etc.) with a rag,” he writes in an e-mail. “For urine, we wash the statue (as well as the area around the base) with a hose.” John Harvard gets attacked about once a week, especially during football season. “They’ve even had guards posted there and it still gets it!” remarks Wayne Baker of Facility Maintenance Operations. With the regular hosing, John’s left foot may be cleaner than one would suspect. All in all, it’s probably not a good place to put a sandwich, but perhaps not so dangerous to give a little rub. No. 6: The Ritz Tour Bus: Three Times a Week, They Come Here to See You.